1 A None No Power Seat 1 A is a standard Business Class seat. The proximity to the lavatory and galley may be bothersome. 1 D None No Power Seat 1 D is a standard Business Class seat. The proximity to the lavatory and galley may be bothersome. 1 G None No Power Seat 1 G is a standard Business Class seat. The proximity to the lavatory and galley may be bothersome. 1 K None No Power Seat 1 K is a standard Business Class seat. The proximity to the lavatory and galley may be bothersome. 12 A None No Power Seat 12 A is a standard Premium Economy seat that has extra legroom due to the position of the bulkhead. The tray table is in the armrest, making the armrest immovable and slightly reducing seat width. There is no floor storage for this seat during take-off and landing. 12 C None No Power Seat 12 C is a standard Premium Economy seat that has extra legroom due to the position of the bulkhead. The tray table is in the armrest, making the armrest immovable and slightly reducing seat width. There is no floor storage for this seat during take-off and landing. 12 D None No Power Seat 12 D is a standard Premium Economy seat that has extra legroom due to the position of the bulkhead. The tray table is in the armrest, making the armrest immovable and slightly reducing seat width. There is no floor storage for this seat during take-off and landing. 12 E None No Power Seat 12 E is a standard Premium Economy seat that has extra legroom due to the position of the bulkhead. The tray table is in the armrest, making the armrest immovable and slightly reducing seat width. There is no floor storage for this seat during take-off and landing. 12 F None No Power Seat 12 F is a standard Premium Economy seat that has extra legroom due to the position of the bulkhead. The tray table is in the armrest, making the armrest immovable and slightly reducing seat width. There is no floor storage for this seat during take-off and landing. 12 G None No Power Seat 12 G is a standard Premium Economy seat that has extra legroom due to the position of the bulkhead. The tray table is in the armrest, making the armrest immovable and slightly reducing seat width. There is no floor storage for this seat during take-off and landing. 12 H None No Power Seat 12 H is a standard Premium Economy seat that has extra legroom due to the position of the bulkhead. The tray table is in the armrest, making the armrest immovable and slightly reducing seat width. There is no floor storage for this seat during take-off and landing. 12 K None No Power Seat 12 K is a standard Premium Economy seat that has extra legroom due to the position of the bulkhead. The tray table is in the armrest, making the armrest immovable and slightly reducing seat width. There is no floor storage for this seat during take-off and landing. 13 A None No Power Seat 13 A is a standard Premium Economy seat. 13 C None No Power Seat 13 C is a standard Premium Economy seat. 13 D None No Power Seat 13 D is a standard Premium Economy seat. 13 E None No Power Seat 13 E is a standard Premium Economy seat. 13 F None No Power Seat 13 F is a standard Premium Economy seat. 13 G None No Power Seat 13 G is a standard Premium Economy seat. 13 H None No Power Seat 13 H is a standard Premium Economy seat. 13 K None No Power Seat 13 K is a standard Premium Economy seat. 14 A None No Power Seat 14 A is a standard Premium Economy seat that is missing a window. 14 C None No Power Seat 14 C is a standard Premium Economy seat, however, the proximity to Economy may be bothersome. 14 D None No Power Seat 14 D is a standard Premium Economy seat, however, the proximity to Economy may be bothersome. 14 E None No Power Seat 14 E is a standard Premium Economy seat, however, the proximity to Economy may be bothersome. 14 F None No Power Seat 14 F is a standard Premium Economy seat, however, the proximity to Economy may be bothersome. 14 G None No Power Seat 14 G is a standard Premium Economy seat, however, the proximity to Economy may be bothersome. 14 H None No Power Seat 14 H is a standard Premium Economy seat, however, the proximity to Economy may be bothersome. 14 K None No Power Seat 14 K is a standard Premium Economy seat that is missing a window. 20 A None No Power Seat 20 A is a standard Economy seat that is missing a window. 20 K None No Power Seat 20 K is a standard Economy seat that is missing a window. 23 A None No Power Seat 23 A is a standard Economy seat with limited recline and the proximity to the lavatories may be bothersome. 23 B None No Power Seat 23 B is a standard Economy seat with limited recline and the proximity to the lavatories may be bothersome. 23 C None No Power Seat 23 C is a standard Economy seat with limited recline and the proximity to the lavatories may be bothersome. 23 D None No Power Seat 23 D is a standard Economy seat with limited recline and the proximity to the lavatories may be bothersome. 23 E None No Power Seat 23 E is a standard Economy seat with limited recline and the proximity to the lavatories may be bothersome. 23 F None No Power Seat 23 F is a standard Economy seat with limited recline and the proximity to the lavatories may be bothersome. 23 G None No Power Seat 23 G is a standard Economy seat with limited recline and the proximity to the lavatories may be bothersome. 23 H None No Power Seat 23 H is a standard Economy seat with limited recline and the proximity to the lavatories may be bothersome. 23 J None No Power Seat 23 J is a standard Economy seat with limited recline and the proximity to the lavatories may be bothersome. 23 K None No Power Seat 23 K is a standard Economy seat with limited recline and the proximity to the lavatories may be bothersome. 30 D None No Power Seat 30 D is a standard Economy seat with extra legroom but whose proximity to the lavatories may be bothersome. 30 E None No Power Seat 30 E is a standard Economy seat with extra legroom but whose proximity to the lavatories may be bothersome. 30 F None No Power Seat 30 F is a standard Economy seat with extra legroom but whose proximity to the lavatories may be bothersome. 30 G None No Power Seat 30 G is a standard Economy seat with extra legroom but whose proximity to the lavatories may be bothersome. 31 A None No Power Seat 31 A is a standard Economy seat with extra legroom but whose proximity to the lavatories may be bothersome. This seat is missing a window. 31 B None No Power Seat 31 B is a standard Economy seat with extra legroom but whose proximity to the lavatories may be bothersome. 31 C None No Power Seat 31 C is a standard Economy seat with extra legroom but whose proximity to the lavatories may be bothersome. 31 H None No Power Seat 31 H is a standard Economy seat with extra legroom but whose proximity to the lavatories may be bothersome. 31 J None No Power Seat 31 J is a standard Economy seat with extra legroom but whose proximity to the lavatories may be bothersome. 31 K None No Power Seat 31 K is a standard Economy seat with extra legroom but whose proximity to the lavatories may be bothersome. This seat is missing a window. 43 A None No Power Seat 43 A is a standard Economy seat whose proximity to the lavatory and galley may be bothersome. 43 B None No Power Seat 43 B is a standard Economy seat whose proximity to the lavatory and galley may be bothersome. 43 C None No Power Seat 43 C is a standard Economy seat whose proximity to the lavatory and galley may be bothersome. 43 D None No Power Seat 43 D is a standard Economy seat whose proximity to the lavatory and galley may be bothersome. 43 E None No Power Seat 43 E is a standard Economy seat whose proximity to the lavatory and galley may be bothersome. 43 F None No Power Seat 43 F is a standard Economy seat whose proximity to the lavatory and galley may be bothersome. 43 G None No Power Seat 43 G is a standard Economy seat whose proximity to the lavatory and galley may be bothersome. 43 H None No Power Seat 43 H is a standard Economy seat whose proximity to the lavatory and galley may be bothersome. 44 H None No Power Seat 44 H is a standard Economy seat whose proximity to the lavatory and galley may be bothersome. 45 H None No Power Seat 45 H is a standard Economy seat whose proximity to the lavatory and galley may be bothersome. 45 J None No Power Seat 45 J is a standard Economy seat whose proximity to the lavatory and galley may be bothersome. 45 K None No Power Seat 45 K is a standard Economy seat whose proximity to the lavatory and galley may be bothersome. 50 D None No Power Seat 50 D is a standard Economy seat with extra legroom, however, the proximity to the lavatory and galley may be bothersome. 50 E None No Power Seat 50 E is a standard Economy seat with extra legroom, however, the proximity to the lavatory and galley may be bothersome. 50 F None No Power Seat 50 F is a standard Economy seat with extra legroom, however, the proximity to the lavatory and galley may be bothersome. 50 G None No Power Seat 50 G is a standard Economy seat with extra legroom, however, the proximity to the lavatory and galley may be bothersome. 51 A None No Power Seat 51 A is a standard Economy seat with extra legroom, however, the proximity to the lavatory and galley may be bothersome. 51 B None No Power Seat 51 B is a standard Economy seat with extra legroom, however, the proximity to the lavatory and galley may be bothersome. 51 C None No Power Seat 51 C is a standard Economy seat with extra legroom, however, the proximity to the lavatory and galley may be bothersome. 51 H None No Power Seat 51 H is a standard Economy seat with extra legroom, however, the proximity to the lavatory and galley may be bothersome. 51 J None No Power Seat 51 J is a standard Economy seat with extra legroom, however, the proximity to the lavatory and galley may be bothersome. 51 K None No Power Seat 51 K is a standard Economy seat with extra legroom, however, the proximity to the lavatory and galley may be bothersome. 56 C None No Power Seat 56 C is a standard Economy seat. 57 C None No Power Seat 57 C is a standard Economy seat. 57 D None No Power Seat 57 D is a standard Economy seat. 57 G None No Power Seat 57 G is a standard Economy seat. 57 H None No Power Seat 57 H is a standard Economy seat. 60 C None No Power Seat 60 C is a standard Economy seat that juts out into the aisle and may be bumped by crew and other flyers. 60 H None No Power Seat 60 H is a standard Economy seat that juts out into the aisle and may be bumped by crew and other flyers. 63 B None No Power Seat 63 B is a standard Economy seat whose proximity to the galley may be bothersome. 63 D None No Power Seat 63 D is a standard Economy seat whose proximity to the galley may be bothersome. 63 G None No Power Seat 63 G is a standard Economy seat whose proximity to the galley may be bothersome. 63 J None No Power Seat 63 J is a standard Economy seat whose proximity to the galley may be bothersome. 64 A None No Power Seat 64 A is a standard Economy seat in the last row of the plane and the proximity to the lavatories and galleys may be bothersome. 64 B None No Power Seat 64 B is a standard Economy seat in the last row of the plane and the proximity to the lavatories and galleys may be bothersome. 64 D None No Power Seat 64 D is a standard Economy seat in the last row of the plane and the proximity to the lavatories and galleys may be bothersome. 64 E None No Power Seat 64 E is a standard Economy seat in the last row of the plane and the proximity to the lavatories and galleys may be bothersome. 64 F None No Power Seat 64 F is a standard Economy seat in the last row of the plane and the proximity to the lavatories and galleys may be bothersome. 64 G None No Power Seat 64 G is a standard Economy seat in the last row of the plane and the proximity to the lavatories and galleys may be bothersome. 64 J None No Power Seat 64 J is a standard Economy seat in the last row of the plane and the proximity to the lavatories and galleys may be bothersome. 64 K None No Power Seat 64 K is a standard Economy seat in the last row of the plane and the proximity to the lavatories and galleys may be bothersome. 7 A None No Power Seat 7 A is a standard Business Class seat whose proximity to the galley may be bothersome. Unlike other seats in Business, this seat only have 1 window instead of 2. 7 K None No Power Seat 7 K is a standard Business Class seat whose proximity to the galley may be bothersome. Unlike other seats in Business, this seat only have 1 window instead of 2. 8 D None No Power Seat 8 D is a standard Business Class seat whose proximity to the lavatories and galley may be bothersome. 8 G None No Power Seat 8 G is a standard Business Class seat whose proximity to the lavatories and galley may be bothersome. 9 A None No Power Seat 9 A is a standard Business Class seat whose proximity to the lavatory may be bothersome. 9 K None No Power Seat 9 K is a standard Business Class seat whose proximity to the lavatory may be bothersome. 110v AC power ports are accessible from every seat in Business and Premium Economy Class. In Economy, power ports are located between seats. Read our guide to in-seat laptop power for more information. The 77W is a long-range, high capacity airliner which features Air Canada's new interior. All seats in this aircraft feature personal inflight audio and video entertainment on demand. Row 18 has TV screens and tray tables built in to the armrests. The housing for these extends almost all the way to the floor, consequently limiting the floor storage for passengers in row 19. The vast legroom is fine, but otherwise this is not a nice seat at all. The already-narrow 10-across seats are even narrower in this row thanks to the in-the-armrest table. Worse, the cabin wall curves inward over you, making it slightly claustrophobic, particularly as there is no window either. Also, while the exit door is flat so it doesn't block your feet as it does in some other aircraft, it's still drafty and freezing cold. Flew 13 hours YYZ-HND with thermal socks and ski parka. The Economy seats are very cramped. 57K has a protrusion so that you can hardly use the armrest on the window side. Service was below average too. If you have the choice - choose another airline! Lots of legroom, and it is a preffered seat so you have to pay for it. Due to the configuration 3-4-3 the seat is very narrow. Traytable and screen is located in the armrest. Seat width is kind of tight. The service was slow. No pre-departure drink, food was not good, amenity kit was cheap. 18A has plenty of legroom. However, the armrests in this row are solid and fixed due to the need to hold a monitor. If the neighboring seats are empty as were 18BC on my flight you will not be able to raise the armrest to obtain more room. This row has no window. There is lots of foot space in front of you, however lots of other passengers use it as stretching space. It is also near the toilet and people leave the door open. Also, as you come in to land, you have you have to stow your tv screen, whereas others can carry on watching. The underseat storage ahead of seat 13g is very limited. My small carry-on bag did not fit - I could only fit the pillow and blanket. Extra legroom in this seat located as the starboard fuselage starts to curve in. This row is not parallel to 59; 60K is 4+ inches further from 59K than 60H is from 59H. 9A is very private with 3 windows, bathroom entry is by exit door not isle so nobody is waiting there, barely hear it. Food sucked, service was good, average selection of beverages. Nice storage with USB power. Flight tracker was Panasonic and worked well. 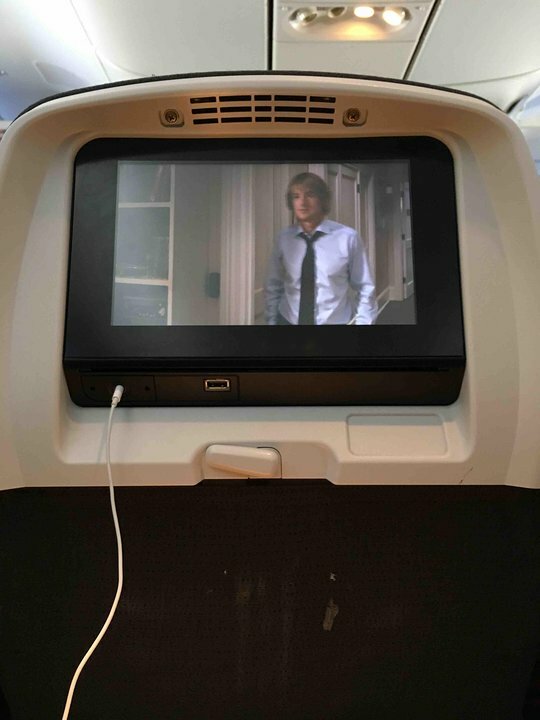 Movie selection was limited compared to other airlines. All seats in this row are Preferred Economy, due to the bulkhead. Centre overhead storage limited because partition blocks one bin (!). E/F armrest is the only movable one. This seat is very good, tons of leg room for someone who is 6"2. The only incovnience is that the the TV is is the chair and its kinda hard to take it out. I would rate this seat green because the legroom is really good, there is no traffic of people since the people in premium dont usually go to economy. Worth every penny, especially oj a 15 hour flight to Japan. The seat had plenty of legroom for a 62 person like myself. 23 H,J,K have zero recline, while all other seats in row 23 have full or nearly full recline. All other back row seats in economy also have full or nearly full recline as already noted correctly in the map. Blessed seat. A lot of legroom, not very close to the toilet, and with partial window opening which prevents a lot of sunlight from streaming in. Pro-tip: instead of paying more to block a preferred seat, ask for it when you checkin at the airport or at the boarding gate. Flown on Premium Economy from FRA-YYZ was great Experience! The seat was extremely comfortable, service was great, absolutely worse the pricy ticket plus, you get all the priority service just like business class passengers (Baggage handling and Boarding priority). There are two versions of 777-300er. The version I prefer is V1 differs from V2 in that: Row 51K side has no toilet so less crowd. The other difference to identify this version when you book is that rows 24 to 29 are missing on this version. 51K though a window seat with an exit door in front there's plenty of legroom even for a 6' person and the fact that there's no toilet on this side even the "stretch-leg" crowd tends to confine themselves to the front of the exit door and into the "gallery". The toilet on the other side is a handicap toilet so bigger - another plus. Row 51 K side is by far the best "preferred seats (even for the isle) compared to 18 which has less legroom and 31 that has toilets on both sides very crowded at all times. This is only true for the particular version of this model. 14K is a terrible seat for a premium economy. There is almost no recline (comparable to an economy seat or even worse), and it seems similar on full row 14. Not worth paying an extra if you have a risk to be on these seats. 18 a and b were perfect, no bathroom close so no lineup of people, lots of legroom! Great seats! 18c was slightly in the aile and that person was bumped constantly when the food cart went by or when someone walked by. Dont take this seat. 61J is not a bad seat. You can grab the underseat storage of 60H. The aisle is very wide (going from 3-4-3 to 2-4-2), I didn't get bumped and people didn't mill around. It's close, but not too close, to the lav. Standard downsides of the back -- last choice on meals and takes eons to exit. This is a bad seat as it does not recline, and the seat in front does recline, leaving less space for the Premium Economy seat than an Economy seat. I purchased extra seat on this flight and the armrest could not lift up. The extra seat costed more than the flight and I could not get any comfort by doing so. Please be aware . 18A has a wall in front and does not have more legroom than other Economy seats, it has less! Worse, the bulkhead on the shoulder eliminates any shoulder room beyond the armrest. Worse seat/flight of my life and I got charged a premium!!?? My next flight on Embraer 175 after this was like being in a lazy boy chair compared to this. Bye bye AC...for charging extra. The Lavatory didn't bother me at all! 12hr flight Beijing to Toronto, semi-comfortable seat, toilet in front of row 50 was out of order so the 2 back lavatories always had long line ups. Food was good but only 2 meals were served over the course of the flight. The new ife system they have is nice but for some reason mine kept on crashing. Bulkhead in premium economy not great if you are tall. There is neither a cutout to stretch your legs nor a foot rest. For tranatlantic flights, an extra couple of inces are needed. This seat was a freat business class seat. Felt VERY private with no one in a "window" next to me. Bathroom proximity wasnt a problem nor the galley - here was the problem: the closet. When latching and unlatching the FAs were very loud and i could hear through the noise cancelling headphones. The amount of times the FAs went into this closet during the flight, Air canada should consider moving whatever is in there. Otherwise brilliant seat. Assume the 8D is just the same. Bulkhead seats are listed on SeatGuru as prime seats. On AC 772 and 773 long haul a/c there is NO footrest in the first (bulkhead) row of PE. AND the left armrest contains the TV, which effectively narrows the seat considerably. We also rode in row 13, and both found that to me more comfortable with both footrests and quite adequate setback screens. New AC Biz seats not as roomy or spacious as old pods. TV is not retractable and fixed in your face. In the sleep position legs either hit the TV(fixed) or sides of the box they are in. Who designed these seats doesn't travel enough to know. 6D and its neighboring seat, are subject to the cabin crew moving the trolleys in the galley. when a trolley bottoms out behind your head, expect a loud and frequent bang. Perhaps rubber stoppers would help. Premium economy is worth the extra money. 8 across instead of 10. 10 across is criminal for a long haul flight. Row 12 has the TV monitor as well as the tray table in the armrests making the seat narrower. Row 13 should be better. In flight entertainment was superb. A peek into business shows that the new layout is much improved. Avoid e and f seats if possible. the seat supports are misaligned so you have to try and put one fut on each side of the support. The aisle row people claim this as their area forcing you to try to stretch one leg at a time. My wife couldn't even get her purse under the seat. There are also some posts for power which makes this even worse. Quick summary avoid the economy e and f seats. Row 20 has no windows unless the seat is reclined. I've always paid extra for Row 18 extra legroom seats but no more. The partitions separating Premium Economy and row 18 are misaligned - Seats 18C and 18H 'stick out' into the aisle. Carts bumped into my knee and the attendant stepped on my foot. If you prefer more legroom, go for row 31 instead. It's way more comfortable, although there are no windows due to the emergency exit. Row 18 has less legroom owing to the bulkhead in front. !4A is already listed as a bad seat: I would add that while it has limited recline, 13A does not, meaning that when 13A is fully reclined, 14A's living space is very limited. You'd be better off in regular economy. For those flying to HKG on the very cramped 777 with 10 abreast seating, complain to AC which use to have 9 across, and select another airline that has 9 abreast seating. This includes Cathay Pacific for non-stop flights, and EVA Air with one stop but you can still earn Aeroplan miles. Both are superior airlines. Lend support to the companies which offer reasonable seats. Worst seat I have ever travelled on. Not only does the seat not recline on a long-haul flight, the leg room appears to be reduced by 2-3 cm as well. I am 180cm tall, broad shouldered, and not obese. My knees were pressed up against the seat in front of me. When the person in front reclined (which I could not), I had to straddle their seat. When reclined the screen in front was 30cm from my face, it hurt my eyes to watch movies because the screen was so close. If you are my height you will not be able to move for the duration of the flight (all 15 hours). You won't be able to reach a bag at your feet because your head hits the seat in front. And of course they charge you full fare for this pleasure. Somehow Air Canada has been permitted to fit 10 people across the body (when all other airlines seat 9 across), and are now removing cabinets to fit in more people (i.e. row 23). The crew did all they could to accommodate, aside from upgrading me to a seat I could fit in. Row 14 in the premium economy is not straight. THerefore 14 A, 14C, 14H and 14K cannot fully recline the seats. The recline is very limited because it hits the back wall. This row does not recline as much as the other 2 Premium Economy rows and should be avoided if you want to stretch out and sleep. It also means less room when the row infront reclines fully. Paid the upcharge to receive a bulkhead seat. It did give me extra leg room, but the bulkhead does not have a floor cutout, so I could not extend my legs all the way when sleeping. Row 31 would be better, no obstructions. You do get 3 windows with this seat. Seat is forward, so noise is minimal. PTV monitor is on a stalk, worked well. Only buy this seat if you are under 5'9". Flew two legs between YVR and PVG this summer and was hardly impressed with the retrofitted 77Ws. My usual LHR-YVR flights are also 10-abreast 77Ws, so the horrific seat width and very mediocre legroom are no surprise, but this layout has something to add to the mix; despite the fact that it is only 400 pax as opposed to 458 due to the extended business section, this layout is for old planes. C-FRAN on the 1st leg and C-FIUV are both OLD, >5 year old 300ERs that have been part of the AC fleet for a long time and used to be comfortable 9-abreast planes. Now refurbished, the age of these planes is beginning to show regardless of how "fresh" they try to make the interior. C-FIUV has a terrible, persistent creaking sound that manifests when the plane is going through anything more than perfectly stable and smooth flight, coming from one of the three bulkheads in front of row 18. The walls on C-FRAN are filthy, comparable to the dilapidated state of British Airways' decades-old 747s. I was slightly relieved to find that row 18 does indeed offer better legroom, but it does not even come close to the amount of legroom found on the V1 and V3 versions of the 10-abreast 77W, which are almost guaranteed to be the newer, 1-2 year old AC 77Ws (unlimited legroom due to absence of bulkhead). TL'DR, just when you thought AC's great big 5 Year Plan for its 200LRs and 300ERs couldn't get worse - it just did. Paying for premium economy was a complete waste of money. The cushion and arm rests were very hard. The length of the cushion was minimal compared with other premium economy seats I have used, resulting in leg cramps while trying to sleep. 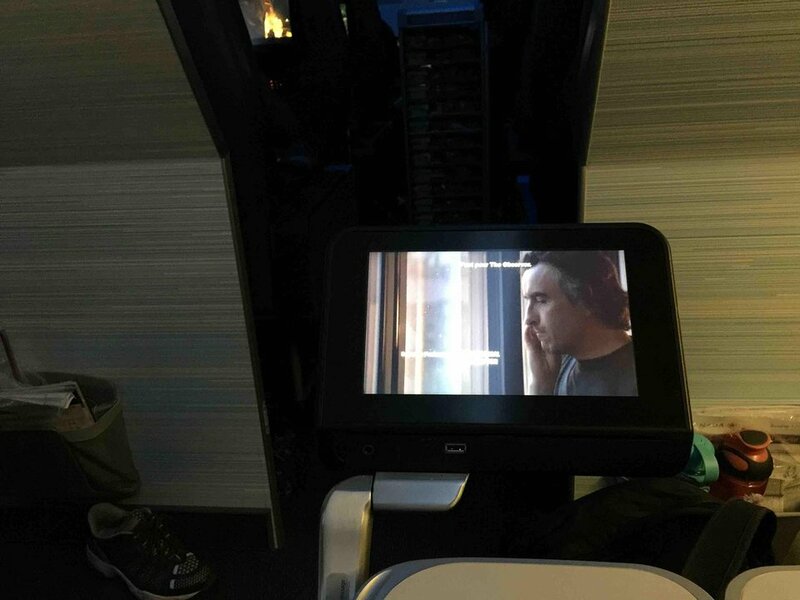 The experience was no where near as comfortable as the economy seating on the new Dreamliner. If choosing Air Canada try to establish if the Dreamliner is on the route. Fairly new plane. Seats are comfortable. Tried to submit photos but the add photo button does not work. Air Canada flies 2 versions of Boeing 777-300ER.